Significant Professional or Academic Accomplishments: “Ms. 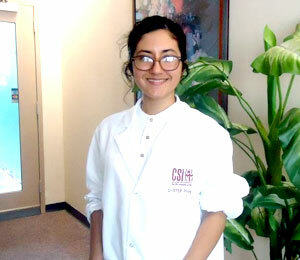 Bibi Ghafari a second (2nd ) year veteran of the CSTEP program at the College of Staten Island. Ms. Ghafari began her academic career as a sophomore, her interest in science lead her to pursue a degree in Biochemistry. Ms. Ghafari spent 8 weeks with the SUNY College of Optometry in their Summer Academic Program. This program is designed as a pre-optometry practicum for first year optometry students, as it is essentially a 2 credit course covering some of the introductory lessons taught to first year students at the college. Ms. Ghafari also spent 5 days in a mini-semester course taught by the faculty at Brookhaven National laboratory. This course was an intensive 40 hour run-through approximately 12 lecture courses covering the importance and impact on some of the active scientific research taking place at the federal laboratory. There were also four tours, as well as a reverse interview conducted by students inquiring on the work or lifestyle of nine active scientists at the facility. Site powered & created and Technology Users Interface, Inc.
All content therein on STEPforLeaders.org is organized by NYS STEP & CSTEP Programs. Copyright © 2009-2019. All Rights Reserved.